Please go to https://coybl.sportngin.com/register/form/784004933 or click on the Lindsays Law logo to go to the registration page. This will allow you to complete your training and electronically sign that you have complied with the Ohio state law. Thank you for helping us keep your children safe. OPENING IN JUNE 2019 IN THE OLD MACY'S BUILDING AT TUTTLE MALL. Nationwide Children’s desires to provide its support to local community organizations that are engaged in competitive athletics at Central Ohio Youth Baseball League by providing priority scheduling and injury hotline, education, sports performance/video analyisis and other sports medicine resources. COYBL ANNOUNCES AN EXCLUSIVE RELATIONSHIP WITH NATIONWIDE CHILDREN'S HOSPITAL SPORTS MEDICINE. ­­­COYBL has entered into a partnership with Nationwide Children’s Hospital Sports Medicine to provide sports medicine services and health and wellness education to our parents, coaches and athletes. 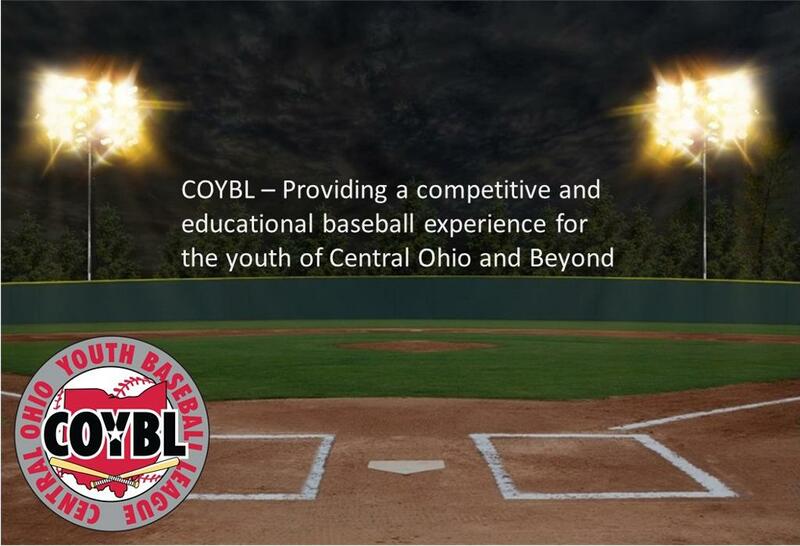 Both organizations strive to provide a safe and healthy experience for youth participating in Baseball and to enhance the quality of life for athletes participating throughout the central Ohio area. Services to be provided by Nationwide Children’s Sports Medicine include medical services, priority scheduling and injury advice through the Hotline “on-call Athletic Trainer”, video analysis, nutrition resources and education from the experts at Nationwide Children’s. The entire team of experts will deliver cutting-edge and comprehensive sports medicine services, resources and education. Nationwide Children’s Sports Medicine includes a staff of physicians, orthopedic surgeons, athletic trainers, strength and conditioning specialists and physical therapists who are all trained to provide age-appropriate patient care to recreational, competitive and elite athletes. In addition to treatment, Nationwide Children’s offers a comprehensive program focused on research, education, injury prevention, strength and conditioning, nutrition and wellness. PLEASE CLICK ON THE IMAGE ABOVE TO GO TO THE COYBL RULES AND INFO PAGE. HERE YOU WILL FIND COMPLETE LEAGUE RULES FOR LEAGUE PLAY TO INCLUDE PITCHING AND BAT RULES AND DOCUMENTATION. We have the mental and physical well being of your children in mind when making policy and rules.